Can The “Word Gap” Be Reduced With Technology? This is the first in a series of articles we are publishing to discuss different aspects of our latest pilot study which has been published in October 2018. This weeks article is exploring the findings from the study. In 2017 we began a pilot study aimed to extend the existing ‘Word Gap’ research and explore language environments in an Irish context for the first time. The study had a particular focus on caregiver behaviour and confidence change. The study was a collaboration between the National College of Ireland (NCI) and Talk2MeMore, the Irish software company responsible for the development and provision of mobile technology. At its core their technology is considered a "Fitbit for words". This technology enabled researchers to gain access to a normalization language environment data set, which covers word counts, volume of positive language, question count and language complexity. We recruited parent's from across Ireland with a child aged 0 - 3 and willing to participate for the 8 week programme. It must be stated that due to the small sample size the results should be interpreted with caution and should not be taken to represent the level of behaviour change which occurred throughout the full sample. As can be seen above, the quantity of words in the language environment does appear to have exhibited some level of change across the study period. This is an increase in the amount of language spoken of 58% by parents with their child from the sample size from the start (n=35) to those who completed (n=8). It should be noted that the quality of these recordings are in question in some cases as the researchers were unable to determine who is speaking (parent or child) or separate background noise e.g. words like Trump and Syria suggest background noise from the television was also recorded. In total, 20% of parents (n=1) indicated increased agreement with the statement “an adult/caregiver talks directly with my child for more than two hours per day”. A further 40% of parents (n=2) demonstrated decreased agreement with this statement and the remaining 40% of parents (n=2) demonstrated no change in their agreement with this statement. 60% of parents (n=3) indicated no change in the extent to which they talk to their child during daily routines (e.g. when cooking, feeding, giving a bath) and the remaining 40% of parents (n=2) indicated a decrease in this behaviour, based on their level of agreement with the statement “I usually talk to my child during daily routines”. parents demonstrated positive behaviour change following the study. At the end of each session, participants were asked to indicate what activity or activities they were engaging in while recording the session with their child. In total 35 caregivers were available for analysis. The retention rate for the complete study period (i.e. eight weeks) was 23% (n=8). The sample represented a diverse range of parent education levels and income levels. The most popular activities engaged during sessions were reading, playing and everyday activities. This is a positive finding in the context of the quality of the children’s language environment, in which naturalistic activities, such as reading, play and everyday activities, have been shown to support language development. 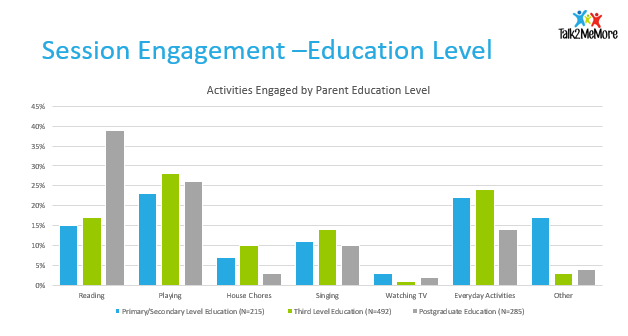 Although engagement in certain activities were comparable between homemakers and employed parents, there was significant variation in parent engagement in reading depending on level of education. The data above showed the for parents with postgraduate level education, 38.7% of responses related to reading. 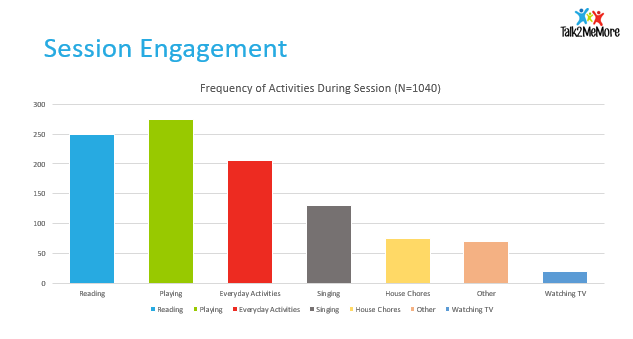 Comparably, reading formed 17.7% of recorded session activities by third level parents (N=492 recorded activities) and 15.3% of recorded session activities by parents with primary or secondary level education (N=215 recorded activities). A significant relationship was also identified between the number of sentences per session and education level and between number of questions per hour and education level. This finding is supported by a body of research which links parental educational level to both the quality of the home learning environment and the developmental and academic outcomes of children. 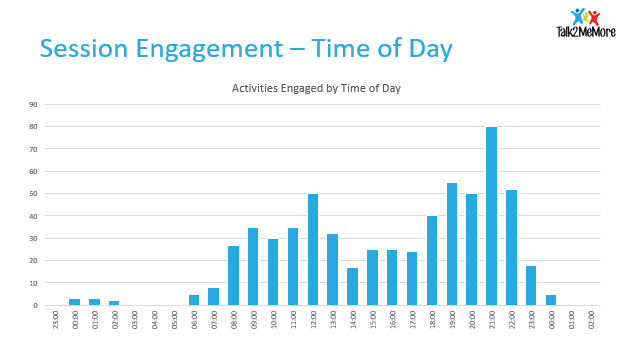 Parents engaged with the app at varying times of day with the highest frequency of sessions recorded between 8 pm and 9 pm. A potential relationship may exist with parents using the app at bed time when reading to their child. Feedback from parents in respect to the Talk2MeMore app is generally positive overall, with some suggestions for improvement of the app in future. Parents observed that "the app was useful for them and their child" and that they learned new strategies, which were delivered in the form of daily tips directly to the app. Due to the sample size and other challenges it made it difficult to meaningfully interpret the results from an academic perspective. However both parties knew this to be an exploratory piece of work. As with all research we must capture the learning's and build on them. What it does shows is with some fine tuning, the Talk2MeMore app has showed the potential technology applied in the correct way could have on creating a rich language environment to help support a child's early language development. The full report can be downloaded from the National College of Ireland website here.